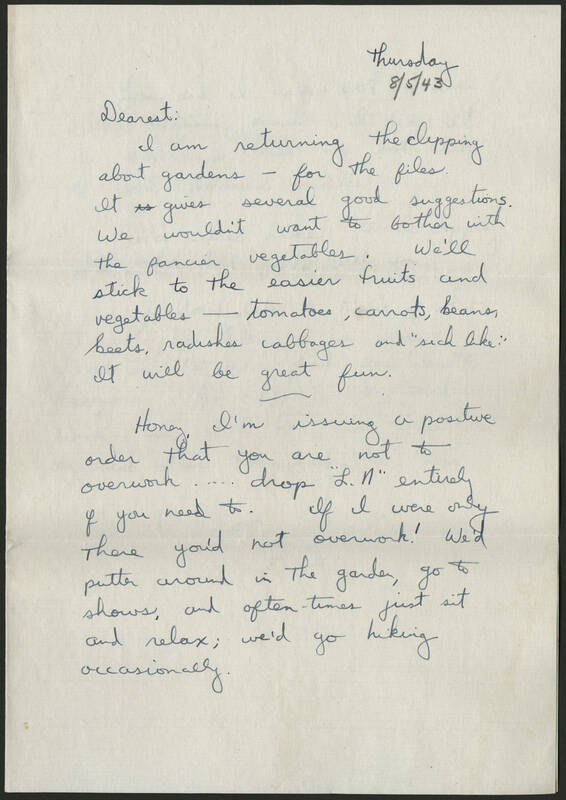 Thursday 8/5/43 Dearest: I am returning the clipping about gardens - for the files. It gives several good suggestions. We wouldn't want to bother with the fancier vegetables. We'll stick to the easier fruits and vegetables - tomatoes, carrots, beans, beets, radishes cabbages and "such like" It will be great fun. Honey, I'm issuing a positive order that you are not to overwork..... drop "L.N" entirely if you need to. If I were only there you'd not overwork! We'd putter around in the garden, go to shows, and often-times just sit and relax; we'd go hiking occasionally.